Another Alphagraphix kit under way here: real old school modelling this one! Card and - if you want a running vehicle - white metal. What you basically do is cut out the card bits, laminate to thicker card, and glue it all up together. 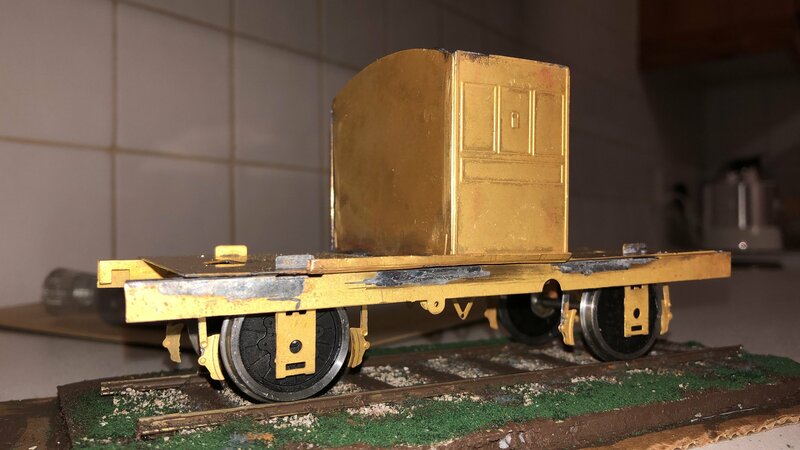 Add a few bits of whitemetal and you have a running wagon in theory. This is my first one - may try another few. 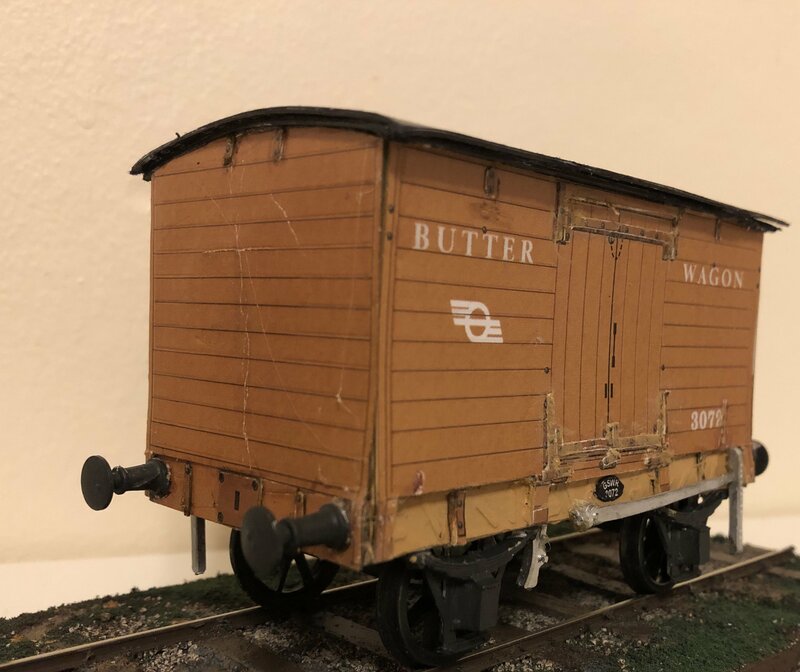 It’s a CIE butter wagon with double roof, running on Walsall Model Engineering wheels pushed out to 36.75mm. It’s a bit rough around the edges (literally!) and I have now learnt a fair bit about how many knife blades such a kit will burn through (about 5). But it’s a cost effective way to acquire stock and fairiy quick. Just some final painting and finishing to do. I’m hoping some gentle weathering will smooth off the rough edges! Thanks JB! Comes as a flat Card sheet. You cut out each piece and stick to 1mm mount board. Then fit those laminates together. This one also features cereal packets, coffee capsule boxes, and wooden stirrers in the mix! Looks very good. Must admit that, though I've bought many card kits from Alphagraphix, I've never actually built one. Instead, just use them as very handy colour drawings as a start for scratchbuilding. Maybe I need to give one a go. Cutting card does take its toll on knife blades though, which is why I've long used the snap off blade variety. It is the tip which blunts so quickly and a snap off blade means you can renew it instantly. Alphagraphix don't seem to have any website....if they do, it must be on the "dark web" because I can't find It anywhere! Any thoughts / ideas, anyone? I have just been down this route - you can contact Roger Crombleholme on sirberkeley@outlook.com. Very helpful and an enormous range of stuff, including the Tyrconnell 7mm etched kits. NO website? Wow - does he have electricity or running water, I wonder! Drooling is indeed appropriate, but the idea of putting stamps in the post to someone was outdated forty years ago, and I premise he'd want British stamps. This makes it awkward for anyone in the south to even see what he has, let alone order it. And with no website, where do we get his postal address? I love the GNR station! His take on loco liveries, by the look of what's displayed, is unfortunately very wide of the mark in many cases. I like his clerestory GSWR 6-wheeler too, though its livery is somewhat inaccurate. There were only a few GSWR six-wheelers with clerestorey roofs, but at least one, I believe, made it into CIE days. Alphagaraphix address = 23 Darris Road, Shelly Park, Birmingham B29 7QY. 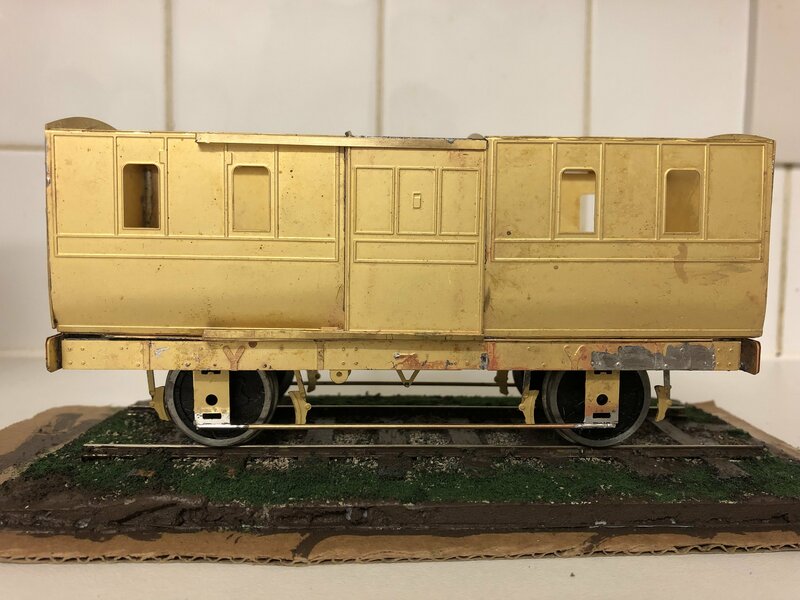 Yes, indeed, and despite my frequent murmurings here about the authenticity of lack of it, of a model, I stand very firmly with the idea that “it’s your layout”. In early 20s I had a fledgling 009 layout based on the West Clare. It never got finished (do they ever? 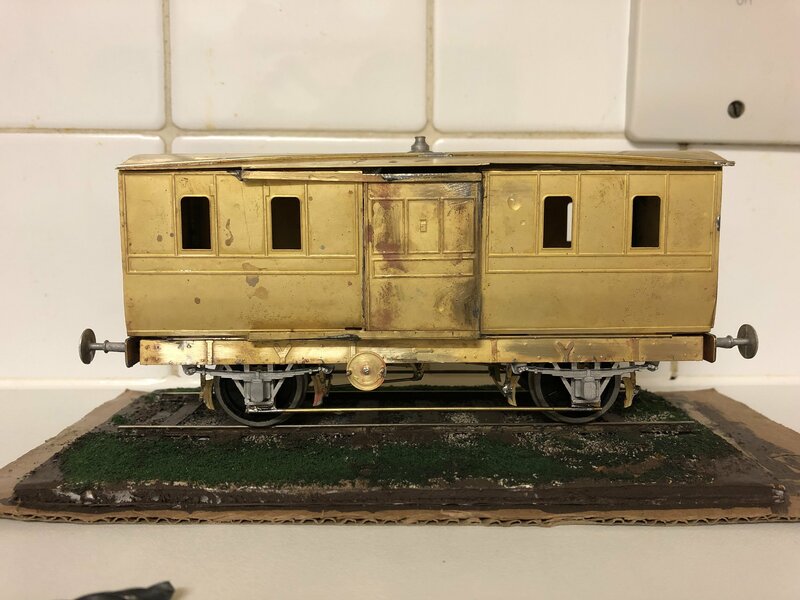 ), but I had bought a whitemetal kit of a Donegal railcar, which would be finished in black’n’tan, had I ever built it. The idea was that the line had lasted into the 1970s, so that a (black’n’tan!) F class could haul a container train! In authenticity terms it would have scored a big fat zero. 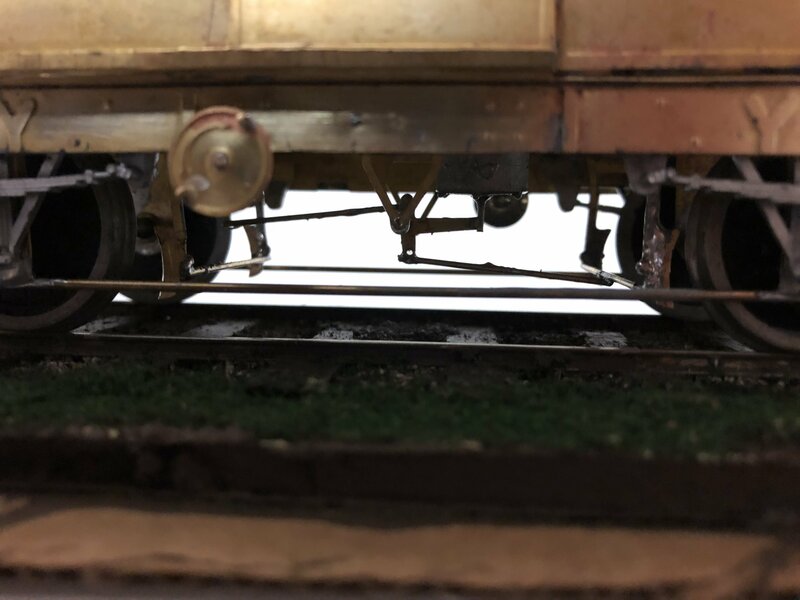 However, I do feel that it is vitally important to have correct info “out there” and widely known, because a great many modellers do seek authenticity. Drew’s models were great, and his layout a joy to behold. Like the famous Donegal layout of the late Sam Carse, the emphasis was on correct railway operation, though devoid of scenery. Drew was a very dogmatic type of character, and as you say he knew better than CIE when it came to liveries! While not authentically painted, I have to agree with him that ALL locos looked better in lined green, than plain grey! As far as Alphagraphix is concerned, they seem to have CIE locos in black, when almost all were dark grey, GSWR locos in unlined black (they should be lined in red and white), and that green Midland engine should also be lined out in black and white. I must get his catalogue for the craic. 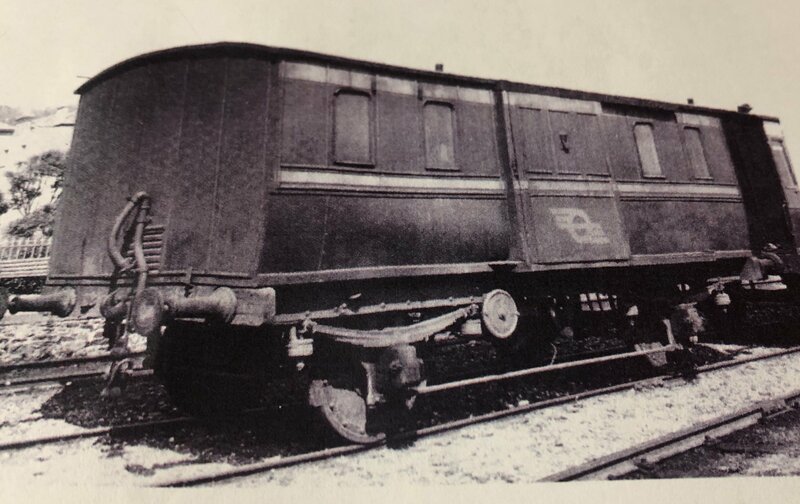 And I still wonder what a West Clare railcar and an F class diesel would have looked like in black’n’tan! The catalogue has a price of £2 on the cover, so suggest emailing Roger to ask him re alternative payment methods. Doesn't do credit cards either, yet on the other hand, his etches are clearly CAD. Very good value and a fantastic resource across a range of media. 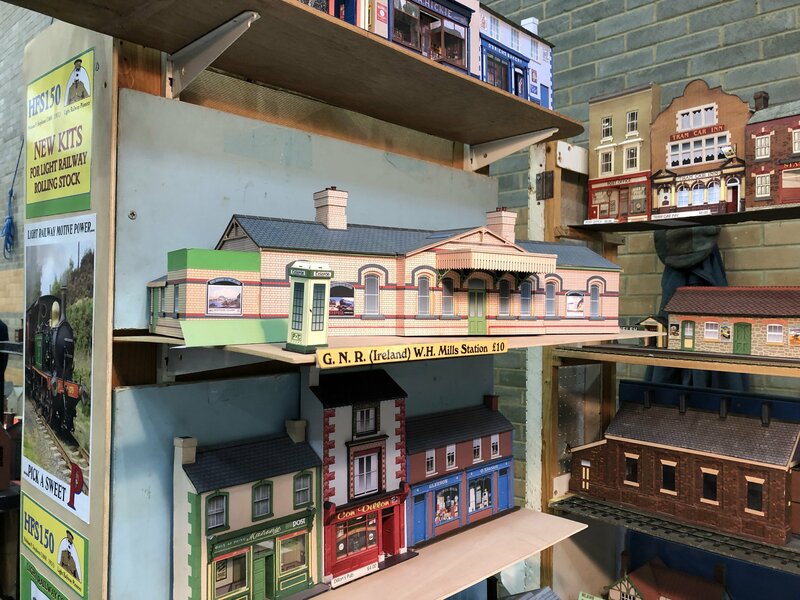 Easily the widest range of Irish stuff that is readily available, especially for 7mm scale. The Worsley Works catalogue possibly has more, but not all at the same time and the etches are just that, no castings or instructions for that matter. Great starting points though. I think we’re probably on the same page, JB! For me the issue is historical plausibility and consistency - having a convincing narrative you can measure the layout against. So basically - could scenario ‘x’ conceivably have happened and what might that have looked like? So a Black and Tan NG set up could well have happened had the West Clare lingered on a few years - and a consistent layout built on that theme could be effective. My planned layout envisages a might have been branch from Sligo to Rosses Point as it was c 1956-57. So I can’t run 141s or 071s -but I can pretend that ‘Argadeen’ was sent out west by CIE after Timoleague shut down! I think we’re probably on the same page, JB! For me the issue is historical plausibility and consistency - having a convincing narrative you can measure the layout against.......... My planned layout envisages a might have been branch from Sligo to Rosses Point as it was c 1956-57. So I can’t run 141s or 071s -but I can pretend that ‘Argadeen’ was sent out west by CIE after Timoleague shut down! Equally, it could have survived until 1967, allowing a 141! JB. I promise that my next steam loco will be in the best approximation to CIE grey I can muster! I’m sending off for an Alpha etc catalogue tonight! I will write a letter, stick a stamp on it and put it in a local Edwardian letterbox tomorrow. My letter will go to Kingstown Pier, and onto the steamship for Holyhead, from where a big LNWR locomotive will bring it to the capital of the Empire. A postman with a big hessian sack will then deliver it to Alpha. It’ll be worth it - lots in the catalogue to tempt you and he is such a nice bloke who has done a great deal for us Irish enthusiasts. 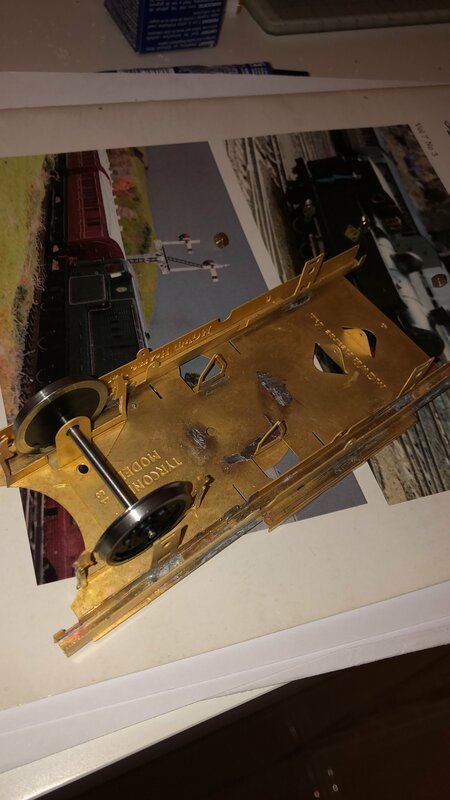 His trading modus operandi is fairly common in the scale - I have one supplier who trades in brass fittings and motors for 7mm. I place an order, he sends me stuff with an invoice and I pay him by cheque! All very old school and rather charming! It is probably worth pointing out that between them the DSER and LNWR would probably have delivered your letter faster than would happen today. I spent a great deal of time in archives in a past life examining various documents. Looking at the dates on letters, the speed at which correspondence could be exchanged was quite remarkable. And post arrived twice a day in some urban areas! It is probably worth pointing out that between them the DSER and LNWR woukd probably have delivered your letter faster than would happen today. I spent a great deal of time in archives in a past life examining various documents. Looking at the dates on letters, the speed at which correspondence could be exchanged was quite remarkable. And post arrived twice a day in some urban areas! Anyway, I've laboured that point ad infinitum. I look forward to seeing what his wares are. If the catalogue lends itself in any way to reproduction of the Irish stuff, I'll post a list here of what he offers. Alphagraphix focus primarily on 7mm scale (brass and card kits) where setting up a website may be more bother than its worth as the majority of sales are likely to arise from exhibition sales, specialist societies and magazine advertising. 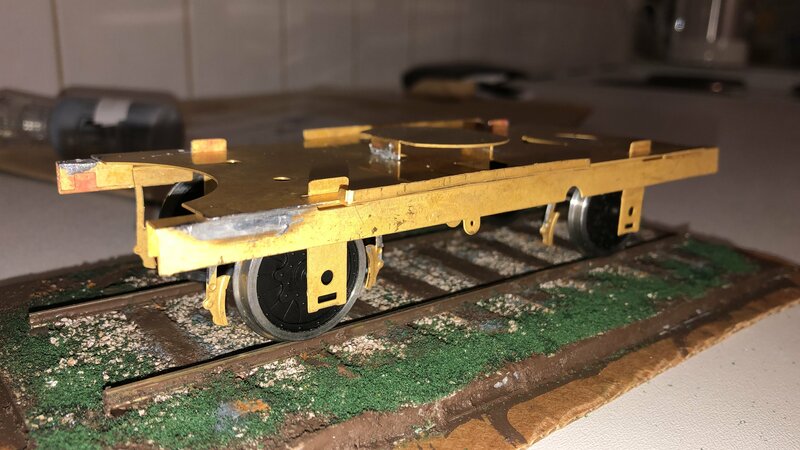 While on-line selling is ideal for fast moving rtr models, it can be very expensive and in-effective for low volume slow moving items like kits and components like wheels and detail castings. 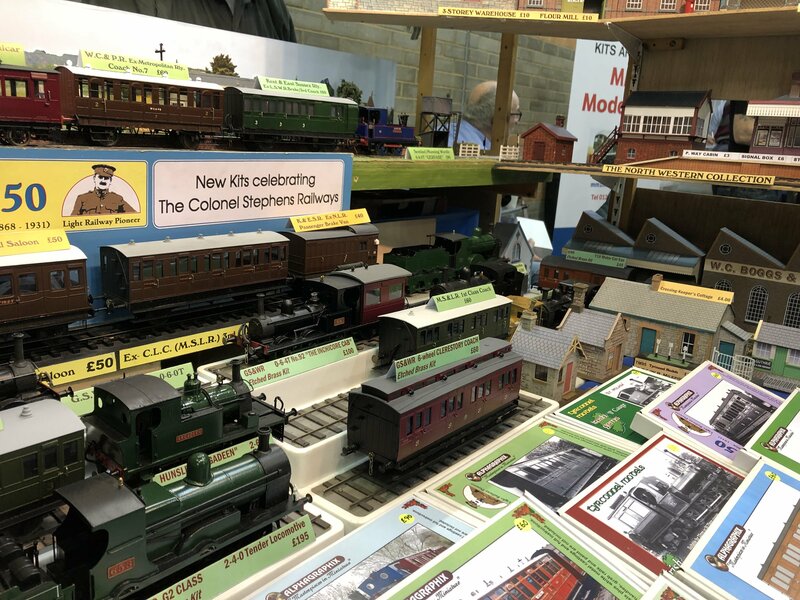 A bit like the railways and the big cattle fairs in the West, specialist suppliers like Alphagraphix are likely to make their profit (or at least cover their costs) through exhibition rather than postal or internet sales. Turning into a nice model though. Will it be green or brown? I originally used Ford Laurel Green from Halfords, but it is a bit dark, when compared to colour photos of the 1950s. 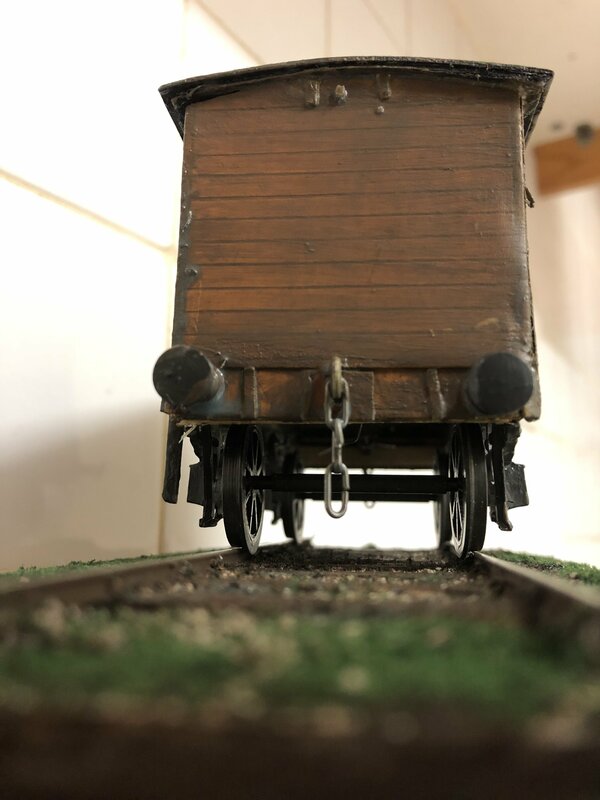 My MGW six wheelers are on pages 2and 3 of my workbench thread if that helps. Now that is an absolute beauty! 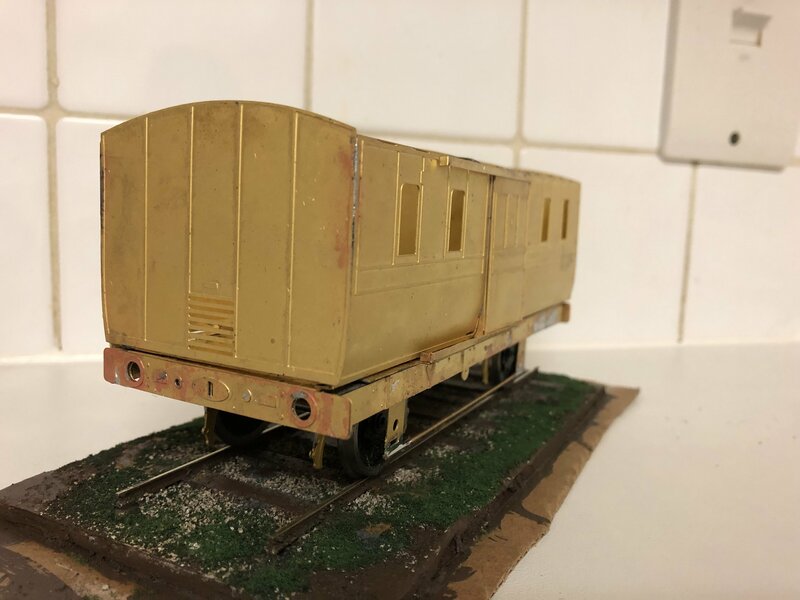 Will it be finished in Midland, GS or CIE livery? Thanks JHB - it’s my first Irish coach so I’m fairly content. Learned loads. She’ll be finished in 1950s green as per Des Coakham’s pic below. 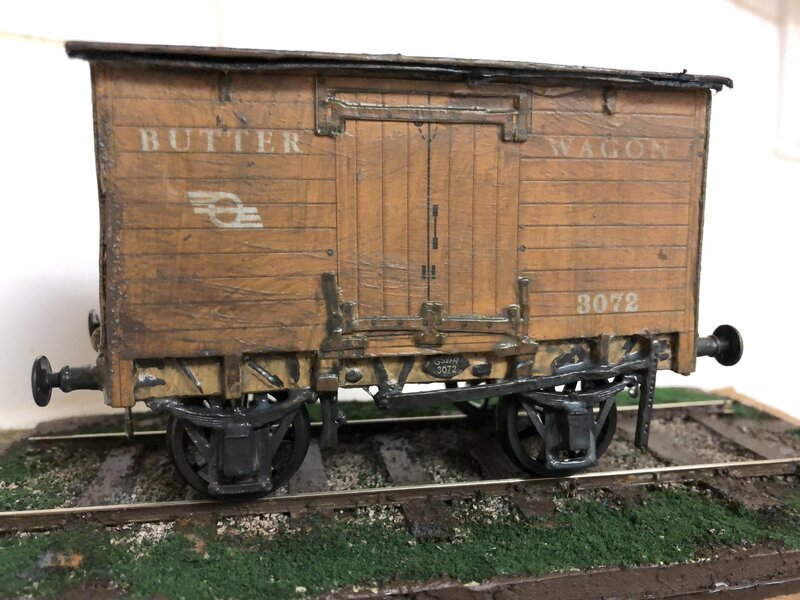 Well, a van like that is absolutely appropriate for such a scenario; indeed, it's likely its the same one that was on the opening train in 1899! Thanks JB. Black roof and ends I take it? Entirely appropriate for the 1st and possibly last trains on the Achill Branch or the afternoon "Perishable" from Rosses Point to Sligo. 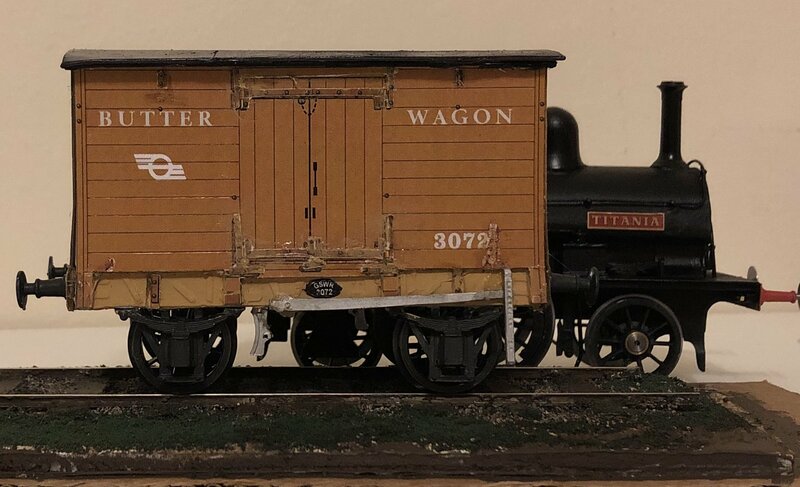 The Alphagraphix kit is a model of MGWR Mortuary Vans 42 & 58. The GSR re-numbered the vans 56M & 58M and ran them as fish vans. 56m (van in photo?) appears to have ended her days most likely as a luggage(pram?) van on the Waterford & Tramore. (Carriage Stock of the MGWR) IRRS paper Padraig O'Cuimin 1972? Yes, one went to the Tramore line for bikes and prams. Ends & chassis black. Roof either black or a very dark grey. A van like this would be very heavily weathered in real life, as they rarely saw a paint brush! Seriously good stuff, everyone! Especially interesting for me as I have one to build too, though maybe not that soon. The brake gear looks good too. Have always hated doing it, so any pictures/info welcome. 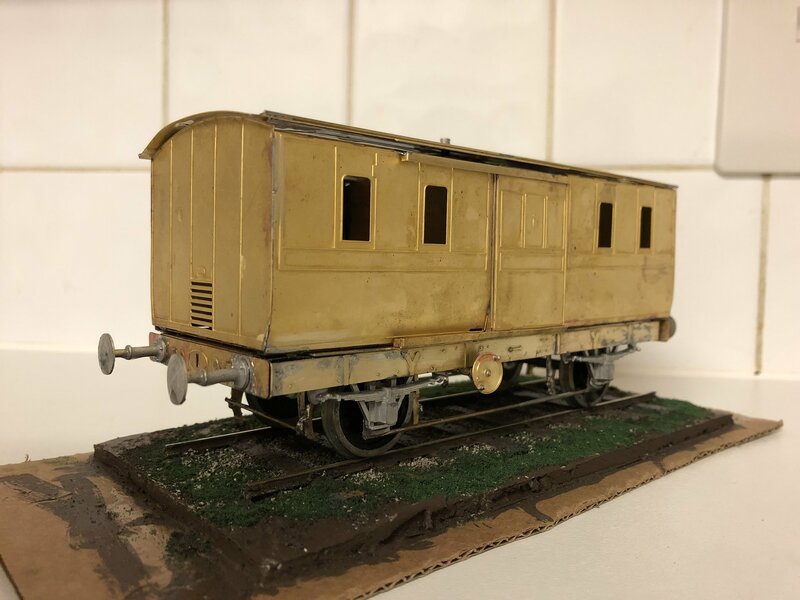 The one problem with Alphagraphix etched brass kits is they are designed for 32mm gauge and need a bit of fettling. This one looks very nice indeed.